Our next Before & After story comes from Amanda Fraijo-Tobin, who blogs about life after losing 130 pounds on her blog Friday Love Song, which is part of our POPSUGAR Select Fitness network. Below, she shares how she lost the weight and how she keeps it off. Growing up, I wasn’t severely overweight — sure, I had a pudgy stage, but a lot of people did! My weight wasn’t something I thought much about being a kid (as it shouldn’t be). My parents had good intentions, like most, but we certainly did not grow up eating very healthy. Snacks, soda, meals prepared without nutritional aspects considered. Soda became a very bad habit for me, especially as I got into my teens and didn’t have anyone stopping me from drinking so many. Fast-forward to high school — like most high school girls, I thought I was fat. Even though, in retrospect, I clearly wasn’t. I didn’t let it consume my life, though I was a little on the chubby side (so I thought) and I was OK with that. Looking back, I think senior year is when the trouble began for me. Stress, changes in my life, poor eating, and not exercising (hello, gym-class-not-required-after-ninth-grade!) led me to pack on some weight. Again, I already felt like a “fat girl,” so I kept going with the mind-set of “This is me — this is who I am.” I was married young, had my first child at 20, and of course, packed on more weight. Divorced, remarried, and two more babies later — more weight. My weight wasn’t something I paid attention to. I never weighed myself. The only time anyone took my weight was maybe once or twice a year when I had a doctor’s visit — and even then, I didn’t think much about it. This is me — this is who I am . . .
My husband is a type 2 diabetic. He had already been on tons of medications for several years to control his blood sugar and other problems associated with the disease. He got to the point of having to add insulin injections to his enormous list of meds. His doctor kept urging him to consider weight-loss surgery, telling him that, if he lost some weight, there was a possibility he may be able to stop taking some of his medications. This seemed like a great solution to my husband — I, on the other hand, disagreed. I told him repeatedly, this wasn’t the solution. If you don’t break bad habits that got you to a certain point, you could not possibly make a real change. Insert light bulb moment. Pot calling kettle black. Even though it wasn’t something I monitored, I was surely at the heaviest point of my life. I was waking up to get my son to school and collapsing on the couch for a nap once he was off. I was having random pains in my foot. I felt gross. I knew I needed to start making changes. I needed to make changes for myself, but also for my husband, for my kids. I needed to be a better example. This wasn’t about vanity. This was about life, making a better life for myself and my family. I knew this wasn’t going to be easy. I had packed on the weight over the course of 10 years. I knew it was going to take some time to take it back off. I knew there would be times I would feel like quitting. But from the start, I adopted a “Today I will do what I can” kind of attitude. This went for exercise as well as eating habits. I knew all my bad eating habits were not going to disappear overnight. Slowly but surely, I made mental lists of things I was doing that were awful for my body and thought of ways to change them. Drink more water, read labels of items I was eating, etc. I had been having such severe pains in my heel that some days I could not even walk on it. Some days, I may not get through an entire workout like I wanted to — that’s OK. Today I will do what I can. I chose not to be vocal about my weight-loss journey from the start. I didn’t mention it to friends. My husband and my father were about the only people who knew what I was trying to accomplish. There were many days of whining on my part to my husband about aches and pains from making my body do things it wasn’t used to doing. I admit I have no idea for sure what my starting weight was. I have a general idea based on the last time I had been weighed at the doctors — but my journey began about six months, and what I’m guessing, may even be more pounds later. I did not start out with a goal weight in mind. I didn’t want one. I wanted to be healthier. Period. Healthy is not pounds on a scale. This is not a short fix; this is a change I will continue to make for the rest of my life. This is common sense, things we have heard a million times again and again. Change the way you eat. Exercise. Repeat. It’s amazing to me when people want to know my “secret.” I have no secret. And I find it even funnier when people feel let down by my answer. There is no magic pill. I have not dieted. I have not counted calories. I knew from the start that was not the way I wanted to live my life. This is a lifestyle change. Know that it’s going to be challenging, but have faith that you can make the changes you want to. About two years later now and around 125 to 135 pounds down, here I am. Still chugging along. Still making it part of my life to make better decisions for my own as well as my family’s health. Honestly, I still feel a little silly writing this. I have had people tell me that they think I am an inspiration, which blows my mind. But I am here to tell you: if I can do this, you can do this. All it takes is a true commitment. Am I a superfit person? No, of course not. But every day, I strive to be a little better. I am a real person who did this. I am a mom to three children with a full-time job, a husband, two dogs, and a million other things going on. It takes work. It takes time. But you can do this. Start today, one small change at a time. This is me — this is who I am. Today I will do what I can. Will you? Do you have an inspiring Before & After story to share? Message us on Facebook, and give us a few details about your journey. We might even profile you on the site, like Amanda! Is It Safe to Eat Raw Oats (as in Overnight Oats)? You fell hard for the overnight oats craze, and we don’t blame you for becoming completely obsessed (we did too!) Overnight oats taste amazing because you can come up with all kinds of delicious flavor combinations from chocolate coconut almond, to banana cashew, to vanilla almond raspberry. They’re easy to throw together and eat on-the-go, and they’re one of the quickest breakfasts you can make that keep you feeling full all morning long. The only issue is that you may have heard that eating raw oats isn’t safe because they contain phytic acid. Soaking oats also helps to break down the starches, so they’re easier to digest (read: less bloating) than cooked oats. If traditionally prepared oatmeal made with rolled or steel cut oats have always been off-limits because it bothers your stomach, overnight oats may not. 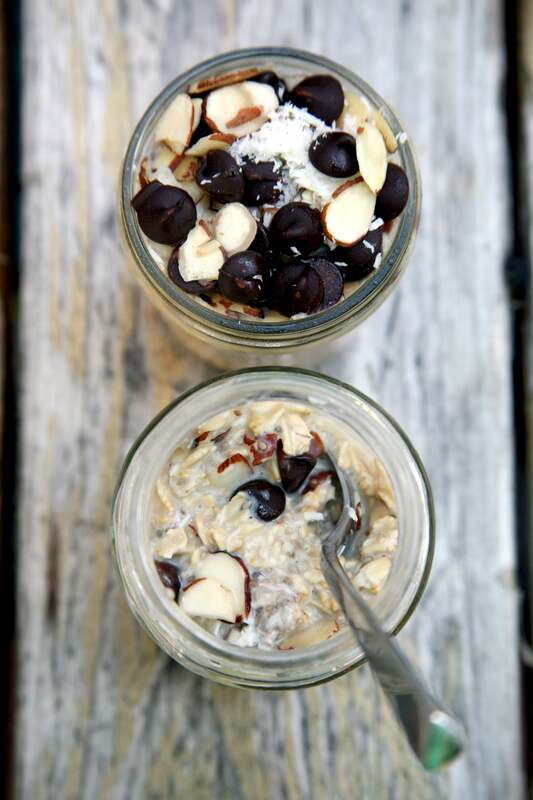 So go ahead and eat overnight oats every morning of the week! They’re safe, easy on the tummy, and a great choice if you’re watching your weight because the complex carbs and fiber keep you fuller. If you really crave a warm bowl, pop your glass jar in the microwave for 30 to 60 seconds. Eating clean is easy when you have all the ingredients on hand. Our 2-Week Clean-Eating Plan sets you up for success with easy-to-make and delicious recipes, printable shopping lists, and a weekly rundown of what to prep, make, and save. The plan, created by the registered dietitians Stephanie Clarke and Willow Jarosh of C&J Nutrition, focuses on whole foods — fruits, veggies, whole grains, healthy fats, and lean proteins. You’ll eat three meals, a snack, and a treat daily. That’s right! Eating clean doesn’t mean denying yourself of foods you love. The plan is alcohol-free, but you can have your morning cup of caffeine provided you drink it without cream since the the plan is dairy-free. The meals, with snacks and treats included, add up to about 1,600 calories per day. The carb, protein, and fat ratio is close to 50:20:30. The carbs are all whole grains so they’re high in fiber. The protein is lean, and the fats are primarily plant-based. And all the food is tasty. The 14-day plan is divided into two weeks, with a separate shopping list for each. The first day of each week is your prep day when you wash, chop, and store the many ingredients you will be cooking with throughout the week. On your prep day and during the week, you will prepare extra servings of some ingredients to use later in the week. Talk about convenience. While you can start the program on any day of the week, you need to follow it in sequence since this plan uses leftovers throughout each week. To help you prep and plan, we have created a rundown of the daily meals and a to-do list for each week. Think of this as your cheat sheet: print it out and put it on your fridge so you can easily follow along. Prep days are important, and honestly, we think the commitment of planning ahead will help you stick to the program. On days one and eight, there is plenty of slicing and dicing to be done and a good amount of cooking. Plan to set aside two to three hours for prep and cook time. It’s also a great idea to think about a day in the middle of the week that might work for doing a small amount of prep for the end of the week. Clean Out Your Fridge: Since you will be buying a bunch of fresh ingredients and then making fabulous meals with all this yummy food, you’ll need ample storage for both the ingredients and the leftovers. Take some time to create space in your fridge to make this process easier. Trust us. We learned from experience. Shop Early: Plan your grocery shopping day one day ahead of your prep day, if possible, since shopping and cooking all in one day can be a little daunting. And since you are only shopping once each week, you will be freezing some of the meat on the plan. Just make sure to start thawing those items the day before, but don’t worry — we remind you about it in the daily rundown. Bulk Bins: Shop the bulk bins to save money by ensuring you have just the amount you need and no more. Look for nuts, seeds, spices, tea, dry goods, and even chocolate in the bulk bins of your local grocery store. Clear Containers: Store prepped produce and other ingredients in clear containers. The more you can see what’s in the fridge, the more likely you are to eat it and not forget about it! We’re sure you have a few questions, so do check out our Frequently Asked Questions, and hopefully you will find your answers there. I truly hate running. I’ve tried every fitness class my city offers — and living in one of the fittest cities in the country means I have a lot of options. And at-home workouts? The living room in my tiny San Francisco apartment is about as wide as my wingspan. I don’t work out, but I am still the healthiest and most fit I’ve been in my adult life. I know that fitness means something different for everyone, and I am not saying that working out is something people shouldn’t be doing, either because they want to, because they need to, or both. But when it pertains to my own fitness regime, I can knock it, because I sure as hell have tried it all. Growing up, I was active and athletic. I participated in an array of sports — from basketball, track, dance, and gymnastics to swimming, diving, and horseback riding. I was also an active nanny for years, and anyone who has kids or works with them knows that keeping up with two toddlers is more work than running a marathon. I loved it all and never once thought of what I was doing as a workout or as something that I had to push myself to do. Then my focus shifted significantly. No longer was I a high schooler with time to spare and a metabolism the speed of light — I was a determined college student dedicated equally to my GPA and happy hour, and then I was a postgrad professional looking for a job. When was I supposed to be squeezing in a trip to the gym, especially considering the fact that getting myself there was like pulling teeth? Still, I tried everything to stay healthy and in shape. I bought fitness videos and watched countless online workouts for people who hate working out, for people who live in small apartments, for people who don’t know body balls from barbells. I signed up for individual classes at yoga, barre, and cycling studios, experimented with different gyms, took boxing lessons, and even tried my hand at aerial silks (which were by far my favorite!). Still, nothing quite did it for me. I skipped classes, made excuses, and ultimately felt worse about myself because I simply couldn’t muster the motivation everyone around me seemingly had for fitness. What I realized about myself is this: I hate exercise that feels like effort. For me to get a good workout, the results need to be incidental, not intentional, which is why fitness activities that aren’t focused on the workout aspect, but more on the fun, appeal to me most. So I stopped working out. I implemented a few simple things into my daily routine — simple being the operative word here — and I have never felt healthier, more in shape, and happier since letting go of other people’s idea of what fitness should be and instead doing what really works best for me. Here’s how I did it. I stay constantly active and on my feet. I am never, ever idle. Seriously, it’s to the point where I risk running into people (and poles) daily because I read while walking through the city. I am constantly on the move, even at work. I get up and down several times an hour and take my laptop to places in the office that allow me to stand (standing desk is next on the list). On the weekends, I make sure to allow myself some downtime with Netflix or a good book, but I don’t waste beautiful, sunny California Saturdays sitting on the couch. I walk everywhere I can. I am lucky to live in a place where walking is not only possible but also very practical. I honestly think this is the key to staying in shape for me. I walk everywhere. I have a Fitbit, but my biggest thing about having one is to not let myself dwell on the nitpicky parts of the device. I don’t log every calorie I eat, and I don’t use it to lose weight. I just love challenging myself every day, and having it on my wrist reminds me to take the stairs instead of the escalator and to not waver at the sight of a San Francisco hill but conquer it so that I’m rewarded with an amazing view when I make it to the top. Just this weekend I caught up with my mom on the phone while walking the three miles from my house to Target (totally worth the trek! ), then hopped on a bus on the way back home since I had bags. Two birds, one stone. I have a very healthy diet. I eat what I think is probably most similar to a Paleo diet — but I don’t diet. I just try to stick to things that are natural, clean, and not overly prepared, like vegetables, fruits, fish, and meat. I also don’t overeat, mainly because I can’t stand feeling sickeningly full, so I am a huge proponent of multiple small meals throughout the day. It makes the workday go by faster when you get to snack on something every couple of hours, anyway! Sweets aren’t my thing, but I swear by a rare steak every now and then and a postwork glass of red wine. I avoid mixed alcoholic drinks because, to be honest, I can’t stand the sugar, and I drink my coffee black unless I opt for green tea instead. I’ve stopped pushing myself to go to classes and join a gym, but instead I save my energy for activities that I can get really excited about. I ski, I swim, I dance, and I ride horses any chance I can get. I’m planning my next biking trip across the Golden Gate Bridge, and my last hike took me on a five-hour adventure through a redwood forest in Northern California. I make fitness fun for myself, and in doing so, I’ve learned to love my version of a “workout” so much that I am more in shape than I’ve ever been in my adult life. I am climbing toward my 30s feeling incredibly fit, and what’s more, I’ve finally found a way to stay healthy without hating it. The weight-loss goal is easily the most popular New Year’s resolution of all time. Gyms flood in January, and markets are cleared out of their healthy staples like kale and quinoa. Then sometime around early February, no one remembers what a New Year’s resolution even is, let alone what they’re doing for their weight-loss goals. The best way to approach this? Make yourself a strategy. Use one of these tips for each month of the year and fill out your calendar for 2017 with what you plan to do, January through December. 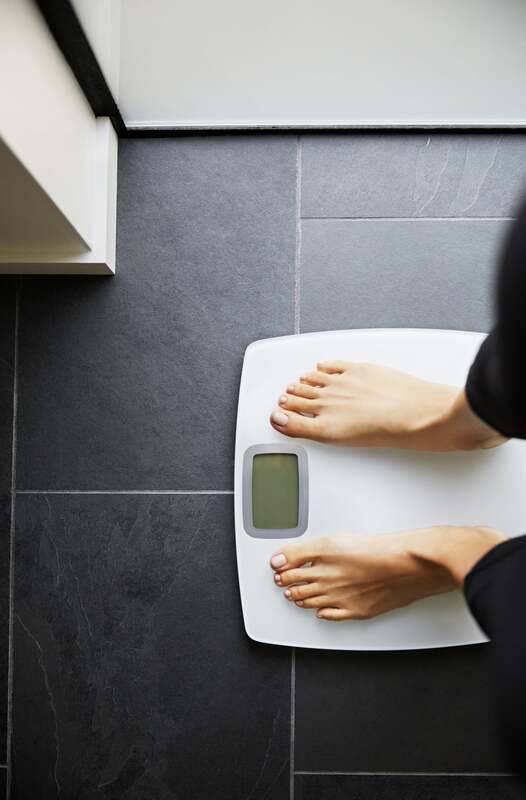 These weight-loss tips have been proven to be effective — and they’re impossibly simple to implement. One month you’ll be drinking more water, and the next trying new veggie recipes — but the common theme throughout the year is that you’ll be hitting your weight-loss goals. Try these 12 tips in 2017 to have your most successful year yet . . . and don’t forget about that gym membership you paid all that money for! Join a gym (or a boutique studio that you love): One of the first steps to moving more is committing yourself to a routine. Whether this is your local gym, or a yoga studio near your office, make it convenient. You won’t go if it’s too far away or has crazy hours that don’t work with your schedule. Also, ensure that you love the style of exercise if it’s a studio — you also won’t go if you hate the workout! Get a tracker: Like a Fitbit or an Apple Watch, specifically! These trackers serve as constant reminders that you need to move more. You’ll get little vibrations and notifications telling you to stand and move — some even tell you to run! Like tying a string around your finger to remind you of a task, these trackers go with you everywhere to remind you to make healthier choices. Try a new workout: Mixing it up is often the key to success — especially if you’ve hit a plateau. Challenge your body in new ways by trying a workout you’ve never done before. One month, pick this new activity you’re interested in, and stick it out for the whole four weeks. Do it regularly, even if it’s a challenge. Not only will you learn a new skill and mix things up for your body, but you’ll feel stronger and more empowered, too. Try four new veggie recipes: Adding more vegetables to your diet is essential to weight loss. Find the ones you actually love, and your favorite way to prepare them so you can fall back on your own staple healthy recipe all year long. Not a fan of brussels sprouts? Try a zucchini recipe. Keep going until you find what you love. Add a vegetable to every meal: We spoke with one woman who told us this was one of the keys to her success — and she lost over 100 pounds! Adding something green to each meal (yes, even breakfast!) will help you get the nutrients you need all day long and create better, long-lasting, healthy habits. Cut out sugar for one week: Longer if you can! If you find that you’re totally addicted to sugar, that can be a major obstacle in your weight-loss journey. Set aside a week to eliminate processed and added sugars — natural sugar is OK! If you can keep going, aim for three weeks; that’s how long it’ll take you to really break a habit. Learn how to count macros . . . and track them for one week to start: Macros are the fats, protein, and carbohydrates in your diet — and the way you balance them can help you lose weight. Start with recipes for breakfast, lunch, and dinner to get a better idea of what your food can look like with macro counting. Drink a glass of water before every meal: Did you know that our brains often confuse thirst for hunger? Drinking more water — especially before meals — can help control appetite and help you lose weight. Get eight hours of sleep every night: Celebrity trainer Harley Pasternak listed sleep as a massive component to weight-loss success. You’ll have more energy for your workouts and more alertness to make better dietary choices. Eat more (healthy) breakfasts: Make it your goal to always eat a healthy breakfast, but one month this year, learn a new breakfast recipe, and make it at least twice a week. Breakfast can kickstart your metabolism, curb a sweet tooth, and control appetite — all leading to weight loss! Practice mindful eating: Slow down, pause, put your fork down between bites. If overeating or eating too quickly has been a challenge for you, this is an essential practice to take up. Choose a month to practice your mindful eating with every single meal. You might be able to stop food cravings for good! Focus on digestion: Take one month to focus on digestion-friendly foods (lots of fiber! ), probiotics, and even a digestion-aiding practice like acupuncture or traditional Chinese medicine. By keeping things regular, you’ll feel better, lighter, and slimmer.